Bollinger Bands® are measures of volatility based on the standard deviations of an asset’s moving average. Standard deviation is a statistical measure of the confidence of a value based on prior values, with a higher standard deviation (further from the asset’s moving average) indicating less certainty and a lower standard deviation (closer to the asset’s moving average) indicating more certainty. A Bollinger Band® chart has three lines: the simple moving average of a stock’s price and two lines each plotted two standard deviations (positively and negatively) away from the SMA. 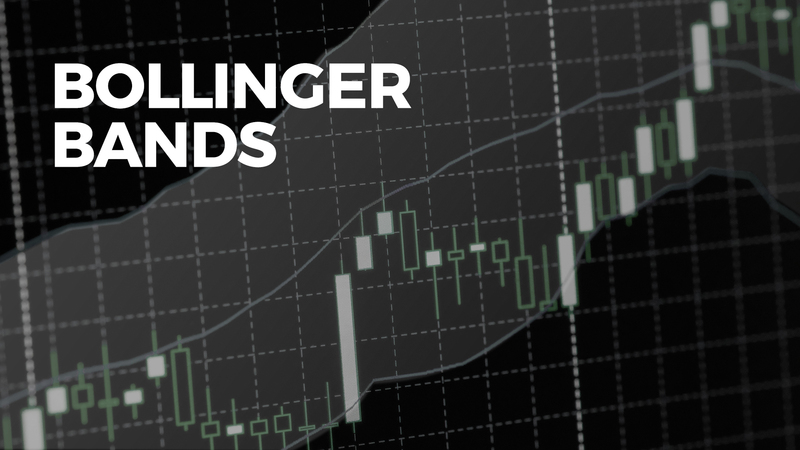 Bollinger Bands® were developed by technical trader John Bollinger in the 1980s. The lower and upper bands often act as strong support and resistance lines, respectively. As mentioned in the Trading Technical Analysis blog, a support line acts as a floor and a resistance line acts as a ceiling, each of which the price doesn’t cross unless there’s a major shift in the market. In the case of Bollinger Bands®, these lines of resistance and support are dynamic and move with the price. Overall, the price tends to return to the middle of the bands after going to either extreme, a phenomenon known as the Bollinger bounce. When the market becomes more volatile, the distance between the Bollinger Bands® widens and when it’s more stable, they contract or squeeze. 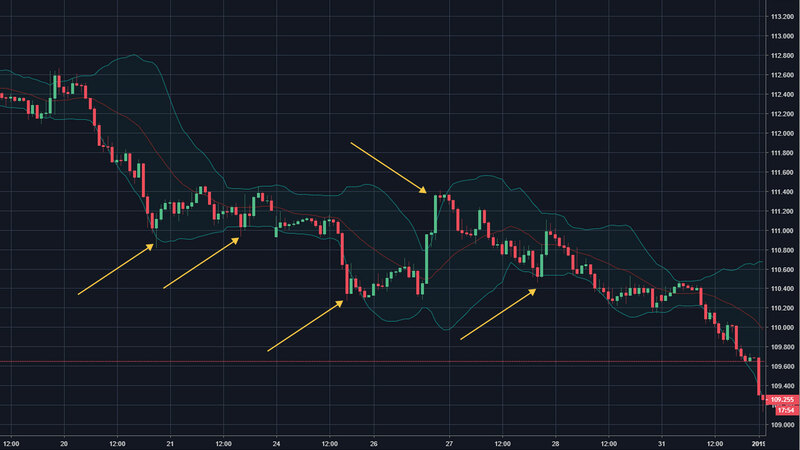 Traders tend to see a widening in the bands as a sign that market conditions will become more stable soon and a contraction or squeeze in the bands as a sign the market will soon become more volatile, which can be a sign of trading opportunity. Traders also understand that the closer prices move towards the upper band, the more overbought (expensive) the market is and the closer they move to the lower band, the more oversold (cheap) the market is. Breakouts describe when a price moves above or below the Bollinger Bands®, which is much more uncommon than them staying between the bands. Breakouts can be considered trading opportunities and happen about 10% of the time, often occurring after a period when the Bollinger Bands® contract. Now the question becomes: how can we predict the direction of a breakout? The trick is to look at the trend. If the market is trending in a negative direction overall and then the bands contract, chances are the breakout will be negative. If the market is trending in a positive direction overall and then the bands contract, chances are the breakout will be positive. Bollinger Bands® are an excellent technical indicator. The easiest way to implement them during trading and benefit from all their movements, even when you’re away from the computer, is by building them into an automated trading strategy. 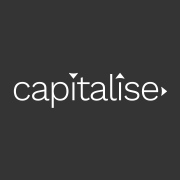 The Capitalise platform is a great automated trading platform where you can do just that. For example, for an automated trading strategy, you can write: Buy X if the price crosses below the lower BB (our short version of Bollinger Band®). The platform’s integration with TradingView charts even allows you to see the current state of the Bollinger Band® chart to help you guess when the price might cross one of the Bollinger Bands® and see the chart’s movement over time. Now that you’re an expert on Bollinger Bands® and how to use them, why not try it out for yourself? Just go to https://app.capitalise.ai/wizard and start using this powerful technical indicator in your own automated trading strategies.